or REFLEKT Remote? Find the answers here. Common questions and all the answers you need to get started using REFLEKT ONE & REFLEKT REMOTE. REFLEKT ONE is the first scalable Augmented Reality platform to enable any industry to simply create in-house AR applications. 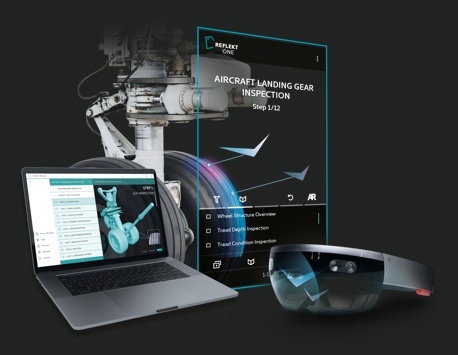 The global ranked No.1 platform for usage-focused AR by ABI Research creates visual guidance on smartphone, tablets and smart glasses for maintenance, training and operations. What are the requirements for REFLEKT ONE? No specific skills are needed to use the REFLEKT ONE Viewer app. 3D and XML authoring basics would be a plus for the REFLEKT ONE Authoring Suite. REFLEKT ONE Author runs on Windows 10 systems. Applications published from REFLEKT ONE Author can be viewed in the REFLEKT ONE Viewer on the following mobile phone / tablet operating systems (iOS 10+ , Android 5+, Windows 10+) as well as on the Microsoft HoloLens. Is upfront training necessary to use the software? If so, how long does it take so. to learn how to create their own AR scenarios? No training is required to use the REFLEKT ONE Viewer app. For specific feature sets RE'FLEKT offers video tutorials to assist with onboarding your team. We recommend 2 to 3 days of training to get started with REFLEKT ONE Author to assist your team in getting started with their first AR content creation. This training is offered as a workshop from RE'FLEKT content creation specialists. For more information about the REFLEKT ONE features such as object tracking, IOT live data, step-by-steps procedure, etc. please see the full list on the following page: www.reflektone.com. Is it possible to customize REFLEKT ONE? Yes, the REFLEKT ONE Viewer app can be customized to match the corporate identity of your company (colors, fonts, logos, etc.). Where is the REFLEKT ONE solution hosted? Are the data encrypted and accessible? For both deployment options (On Premise or Cloud), RE'FLEKT ensures full data privacy and encryption throughout the whole workflow. All CAD files are protected and cannot be retrieved by the end-user. Is it possible to integrate/interface REFLEKT ONE with 3rd party systems? 1. integration into a Content Management System (CMS) or XML documentation authoring tool to leverage existing documentation in Augmented Reality. Integrations are already available with some of the main CMS software platforms, such as SCHEMA ST4, DOCUFY, Adobe Framemaker, Bosch XML Compass,..
What is the pricing structure of REFLEKT ONE? REFLEKT ONE can be purchased as a license model (annual subscription). For more information, please contact us to discuss a license configuration that fits best your needs (e.g. number of authoring seats, deployment option (on premise or cloud), pay-per-view viewer app or user-based viewer app,...). In case you are interested in a custom AR project, feel free to contact us directly since every use case is unique in its required scope of work. Is support provided with REFLEKT ONE? 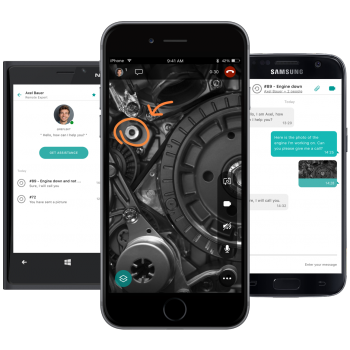 Support and product updates are included in the annual subscription of the REFLEKT ONE licenses. A service desk is available for our customers as well as video tutorials. Is it possible to partner with RE'FLEKT? Sure! RE'FLEKT runs a partnership program with different options for value-added-resellers, system integrators, TecDoc providers etc. For more information about our partnership program, please get in touch with us. 1. Trial + training workshop. During your trial, you will also benefit from direct support from our pre-sales team during weekly calls. Create your own content and visualize it in an AR app! 2. Proof-of-Concept project involving RE'FLEKT Professional Services team to validate the use of REFLEKT ONE in your organization. Get your own app within weeks! 3. Deployment + Training workshop: get a 2 to 3 days training and deploy the REFLEKT ONE licenses within your organisation. REFLEKT Remote allows compa­nies to provide their custo­mers with a remote support to signi­fi­cantly improve main­ten­ance, repair and support processes as well as redu­cing onsite and travel costs for experts. What are the requirements for REFLEKT Remote? For calls, an internet connection of at least 3G is recommended as well as a mobile device or Windows laptop. There are no prerequisites for user management as REFLEKT Remote admins within your company can provide each user with an account email and password within the tool. The REFLEKT Remote app runs on the following mobile phone / tablet operating systems (iOS 10+, Android 5+). Windows laptops as well as smart glasses including the Vuzix M-300, the RealWear HTM-1, the Epson Moverio BT-300 are also supported. No training is required to use REFLEKT Remote. It is easy, user-friendly and self-explanatory. Some tutorial videos are available for new user onboarding if needed. For more information about the REFLEKT Remote features such as Augmented Reality annotations, incident-based ticketing system, intelligent routing, etc. please see the full list on the following page: www.reflektremote.com. Is it possible to customize REFLEKT Remote? Where is the REFLEKT Remote solution hosted? The REFLEKT Remote solution is hosted in the Azure Cloud per default (On-premise on request). The mobile app can be downloaded directly from the app stores and a web-based admin portal is available to you for the user management and data reporting. Is the data encrypted and accessible? REFLEKT Remote complies with GDPR regulations. All data and communications are additionally TLS (Transport Layer Security) encrypted. What is the pricing structure of REFLEKT Remote? REFLEKT Remote product can be purchased as a license model (annual subscription) based on the number of users (field service technicians / operators and experts..). For more information, please contact us to discuss a license configuration that fits best your needs. Is support provided with REFLEKT Remote? Support and product updates are included in the annual subscription of REFLEKT Remote licenses. A service desk is available for our customers as well as video tutorials. Let's start with a live demo of REFLEKT Remote to show you some of the product features. Then you can join a free trial before deploying some licenses.